Can you spell a Kangaroo?Yes, at Alphabet City Zoo!Spell a picture, not a word - That's the craziest thing I've heard! Find the letters in the art It's easy once you make a start. All the letters can be found, Back-to-front or upside-down. Spell each creature, find its name, That's the alphabetical game.An introduction to typographic design for children of all ages. 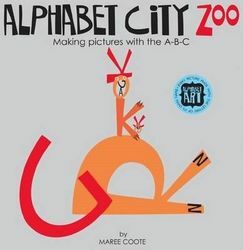 The first book of its kind, Alphabet City Zoo improves letter recognition, observation, spelling and design skills.Concrete or shape poetry is poetry in which the typographical arrangement of words is as important in conveying the intended effect as the conventional elements of the poem, such as meaning of words, rhythm, rhyme and so on.